After testing countless outdoor fire pit tables we have come up with a list of the best ones. Read full review now! Outland Living Series 401 outdoor fire pit table is the best have have tested. Everything of this table is high quality. The wicker is made from all weather resistant ultraviolet light high density polyethylene and frame is made from sturdy powder-coated aluminum. Whereas many tables come with minimum amount of rocks that are basic quality, this table comes with plenty of them to fill the burn pan. The rocks themselves are high quality and very beautiful. They are white/clear and look like melting ice cubes and puts off a gorgeous flame. The flame is 100% smoke free. This outdoor fire pit table proves a nice heat – not tons of it but it’s nice to put your feet on the edge on a colder weather. The heat output is rated at 35,000 BTU according to manufacturer. The assembly is super easy and simple. It can be done by a single person and takes about 30 minutes. The table comes with clear instructions including how to arrange the rocks so it doesn’t cover the flame. However be careful when unpacking so the glass top doesn’t fall out. Accessories like wind screen, flush lid, and a cover can be bought separately. They are really great and I suggest to get them especially the wind screen which adds so much ambience when fire reflects from it. 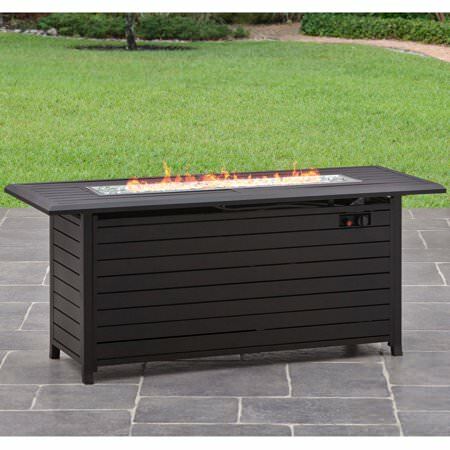 Legacy Heating Aluminum outdoor fire pit table is the second best have have tested. The heat output is rated at 50,000 BTU so it heats well. 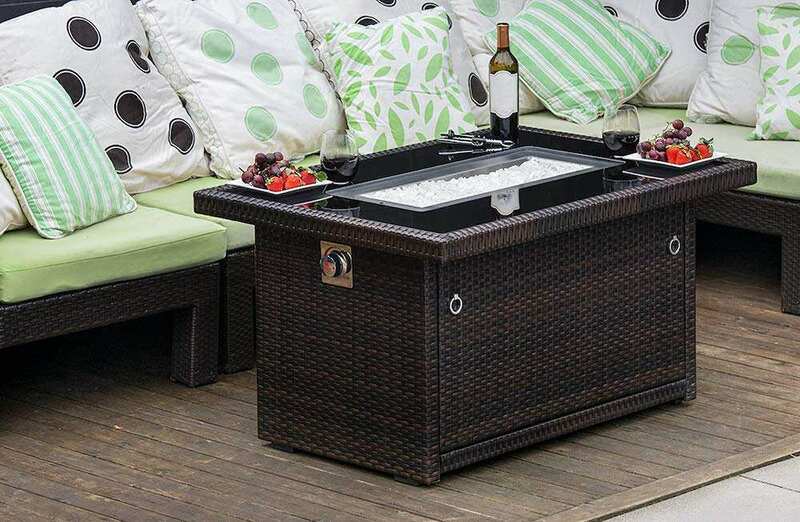 This is a high quality outdoor fire pit table that’s well constructed and durable. It’s very beautiful but hammered metal is pretty shiny which some might love and others hate.The fire glass looks like water when the flames are flickering off stones. The construction is aluminum and the burner is made from stainless steel. It puts off great heat and is very pretty. If you don’t like super shiny, this may not be for you. The hammered metal is quite shiny, but I like it, and it is very durable. The table is simple to construct. Endless Summer outdoor fire pit table is the third best have have tested. It looks good and produces nice amount of heat. The heat output is rated at 40,000 BTU. It comes with lava rocks. However the table has some shortcomings. First of all it was a quite difficult to put together. 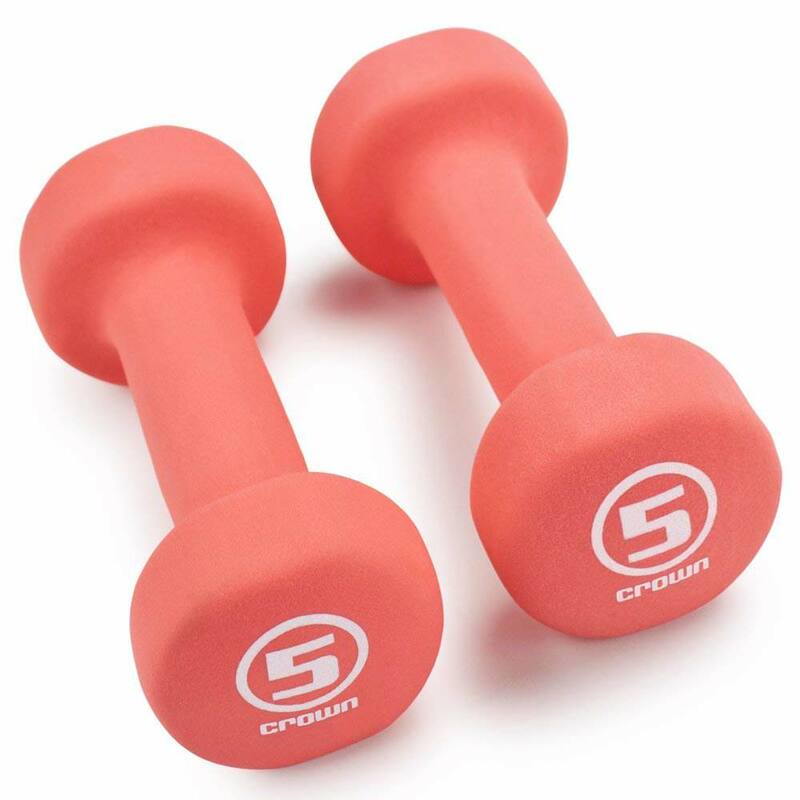 The slate top is very heavy and is nearly impossible to handle alone so you will probably need someone to help you. Without adjustments it tends to burn too rich and can produce some soot and toxic smell. The tiles could fit better, however the table still looks good. Overall it’s still a pretty decent outdoor fire pit table but it’s no match for the other two.